California regulators on Thursday closed 33 oil company wells that had injected wastewater into potentially drinkable aquifers protected by federal law. The new closures bring to 56 the number of oil-field wastewater injection wells shut down by the state after officials realized they were pumping oil-tainted water into aquifers that potentially could be used for drinking or irrigation. All but two of the latest closures are in Kern County, in California’s drought-stricken Central Valley. One lies in Ventura County, another in northern Los Angeles County. Officials with California’s Division of Oil, Gas and Geothermal Resources spent Friday verifying that they had, in fact, closed. Of the 33, only 21 had been actively injecting wastewater before Thursday. “This is part of our ongoing effort to ensure that California’s groundwater resources are protected as oil and gas production take place,” said Steven Bohlen, the division’s supervisor. California’s oil fields contain large amounts of salty water that comes to the surface mixed with the oil. It must be separated from the petroleum and disposed of, often by injecting it back underground. Much of the water is pumped back into the same geologic formation it came from. But enough left-over water remains that companies must find other places to put it. The division, part of California’s Department of Conservation, for years issued oil companies permits to inject their left-over water into aquifers that were supposed to be off-limits, protected by the federal Safe Drinking Water Act. The problem, detailed in a Chronicle investigation earlier this year, raised fears of water contamination in a state struggling through a historic, four-year drought. So far, however, no drinking water supplies have been found to be tainted by the injections. Still, some environmentalists expressed outrage that so few wells had been closed. The division has identified 178 wells that were injecting into legally protected aquifers with relatively high water quality, defined as those with a maximum of 3,000 parts per million of total dissolved solids. More than 2,000 other wells inject into aquifers that would be harder to use for drinking water, either because they are too salty or because they also contain oil. The division reported Friday, however, that not all 178 wells required closure. Some had already been shut down by their operators, while others had been converted into wells for extracting oil — not dumping wastewater. An oil industry trade group noted that all of the wells closed Thursday had received state permits, even if the state now acknowledges that those permits should never have been issued. “Both regulators and producers are committed to protecting underground water supplies, and today’s announcement reinforces the seriousness of that commitment,” said Catherine Reheis-Boyd, president of the Western States Petroleum Association. “California’s oil and natural gas producers are committed to operating their wells in a manner that continues to safeguard public water supplies,” she said. Revelations that the division allowed injections into relatively fresh groundwater supplies touched off a political firestorm, triggered lawsuits, and led Bohlen to launch a reorganization of his staff. More well closures will likely follow. Under regulations adopted this year, wells injecting into aquifers with water quality between 3,000 and 10,000 total dissolved solids must cease injections by Feb. 15, 2017, unless granted an exemption from the federal Environmental Protection Agency. Oil companies will probably have to stop injecting their wastewater into 10 Central Valley aquifers that the state has let them use for years, in the latest fallout from a simmering dispute over whether California has adequately protected its groundwater from contamination. The aquifers lie at the heart of a decades-old bureaucratic snafu whose discovery has upended the state office that regulates oil-field operations and prompted lawmakers to demand reform. Starting in 1983, California’s Division of Oil, Gas and Geothermal Resources let companies dump water left over from their drilling operations into 11 aquifers that the state believed had received federal exemptions from the U.S. Safe Drinking Water Act, which shields groundwater supplies from pollution. But the U.S. Environmental Protection Agency insisted it had never granted the exemptions. The aquifers, according to the EPA, should have been protected. After the disagreement came to light, the division agreed to stop oil-company injections into the disputed aquifers or ask the EPA for formal exemptions, which would allow oil companies to continue using the aquifers for disposal. But in an update to the EPA on Wednesday, the division said 10 of the 11 aquifers probably would not meet the legal standards for exemption. They lie too close to the surface — in one case, as shallow as 200 feet — and their water isn’t salty enough. One of the 10 aquifers may still be eligible for an exemption, because it may be part of an oil reservoir, said division spokesman Donald Drysdale. The division is still seeking more information. “We’re trying to run that to ground right now,” he said. Five of the aquifers are no longer being used for wastewater disposal, according to the division. If the others don’t receive exemptions, wastewater injections there must stop by Dec. 31, 2016. California’s oil fields contain large amounts of salty water mixed with the oil, the remains of an ancient sea. That water must be stripped from the petroleum and disposed of, usually by pumping it back underground. Often, it goes back into the same oil reservoir it came from. But over time, the division has allowed oil companies to inject billions of barrels of this wastewater into aquifers that had relatively clean water — water that with treatment could have been used for drinking or irrigation. So far, the state has not found any instances in which the injections contaminated drinking-water supplies. But the division has shut down 23 injection wells that it considered high-risk, due to their close proximity to drinking-water wells. The division has now established a timetable for phasing out all of the injections into aquifers that should have been protected by the Safe Drinking Water Act, with the last injection wells scheduled to close in February 2017. That long time frame will give the oil companies a chance to find other ways to deal with their “produced water.” But it has infuriated environmentalists, who have sued the state to force an immediate shutdown of the injection wells. The federal EPA can exempt aquifers from the law, but only under stringent conditions. The aquifer must be salty enough or deep enough that tapping it for drinking water isn’t practical. If it contains significant amounts of oil or minerals, it’s considered a strong candidate for exemption. If, however, someone already uses it for drinking, it cannot receive an exemption. David R. Baker is a San Francisco Chronicle staff writer. SACRAMENTO, Calif.— A study released today by the California Council on Science and Technology warns that fracking and other oil extraction techniques emit dangerous air pollution and threaten to contaminate California’s drinking water supplies. Millions of Californians live near active oil and gas wells, which exposes them to the air pollutants indentified in the report. The troubling findings come a week after Gov. Jerry Brown’s oil officials finalized new fracking regulations that do little to address such public health and water pollution risks. Last week the state’s Department of Conservation began implementing new fracking regulations and finalized an assessment of fracking’s health and environmental risks, even though the science council had not finished evaluating fracking’s dangers. The science council is an independent, nonprofit organization that advises California officials on policy issues. Today’s report concludes that fracking in California happens at unusually shallow depths, dangerously close to underground drinking water supplies, with unusually high chemical concentrations. That poses a serious threat to aquifers during the worst drought in California history. Air pollution is also a major concern. In the Los Angeles area, the report identifies 1.7 million people — and hundreds of daycare facilities, schools and retirement homes — within one mile of an active oil or gas well. Atmospheric concentrations of pollutants near these oil production sites “can present risks to human health,” the study says. But Gov. Brown’s new fracking regulations do not address deadly air pollutants like particulate matter and air toxic chemicals. A recent Center analysis found that oil companies engaged in extreme oil production methods have used millions of pounds of air toxics in the Los Angeles Basin. California places no limits on how close oil and gas wells can be to homes, schools or daycare facilities, which can expose people to dangerous air pollution from fracking and other oil extraction procedures. Serious concerns are raised over the oil industry’s disposal of fracking waste fluid and produced water into open pits and the use of oil waste fluid to irrigate crops. Wildlife habitat can be fragmented or lost because of fracking and other oil development – and fracking-related oil development in California “coincides with ecologically sensitive areas” in Kern and Ventura Counties. Confirmation that many oil industry wastewater injection wells are close to active faults — a practice has triggered earthquakes in other states. The science council identified more than 1,000 active injection wells within 1.5 miles of a mapped active fault — and more than 150 are within 656 feet. PHOTO: A hydraulic fracturing well in Kern County. The safety of fracking is the subject of a new report. Photo credit: California Council on Science and Technology. 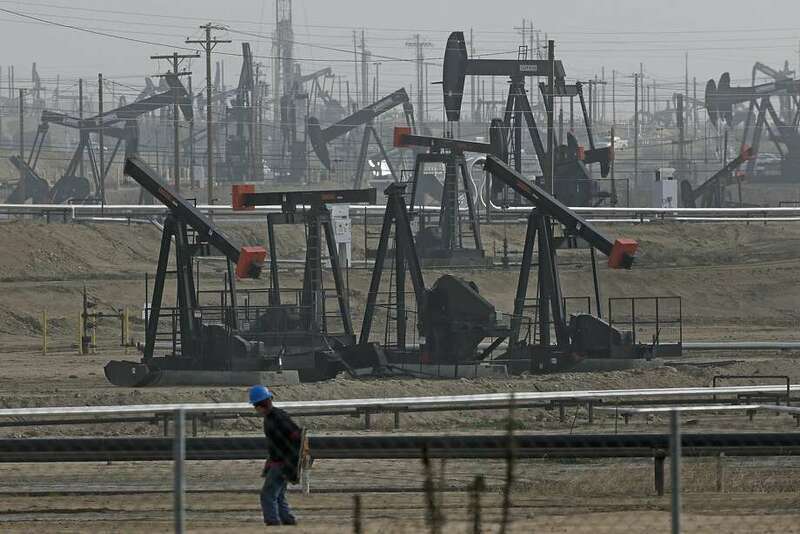 SACRAMENTO, Calif – A new report says hydraulic fracturing can contaminate groundwater when the excess water is not properly disposed of, but is not linked to earthquakes in California. In January, a study by the Seismological Society of America linked a series of earthquakes in Ohio to fracking, and there have been similar claims in other states as well. The new study released Thursday comes from the California Council on Science and Technology and the Lawrence Berkeley National Laboratory. Jane Long, the lead scientific researcher, says hydraulic fracturing poses some safety concerns but they’re manageable. The report says the oil companies should phase out percolation ponds used to dispose of excess water because toxic fracking chemicals can get into the aquifer. And it recommends companies put aside about a third of the chemicals currently in use because there’s not enough data about them. The Center for Biological Diversity points to the finding that oil operations can pollute the air in their immediate vicinity. Long is optimistic that the report will spur further reforms. “Some of them are going to be recommendations that will be very easy to act on right away and I think they will be acted on and some of them are going to require some process,” she says. The report was required by the 2013 passage of State Senate Bill 4, which established new safety measures for fracking, rules that went into effect on July 1.